The 37th congress of the Communist Party of Sweden was held 26th – 28th May. The entire congress was characterised by lively discussions and a good comradeship. Each congress is a milestone in the development of the Party, and the 37th congress was no exception to this. 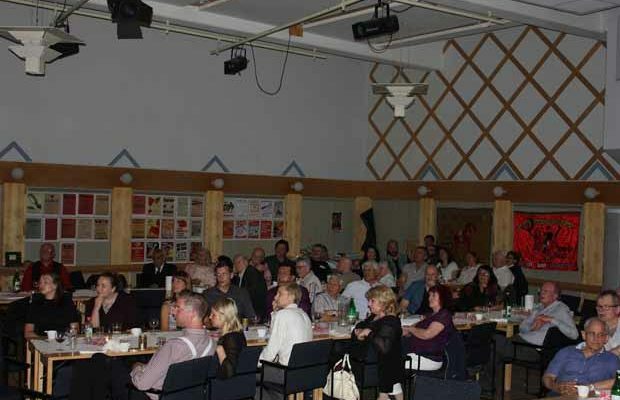 During three intense days, a varied group of communists from Piteå in the north to Malmö in the south were gathered. Workers and unemployed, students and retired people came together to define the party′s tactics and to evaluate past activity. New comrades and comrades with almost 50 years of membership met in order to analyse the situation in Sweden, and youthful enthusiasm was a hallmark of the congress, with a strong optimism about the future – something shared by the youngest delegate of 21 years and the oldest one of 86. During months of preparations and discussions in the party′s basic organisations a lot of questions were prepared for the congress, and during the congress days the time was ripe for making decisions. In the time leading up to this congress, the party, for practical reasons, had decided only to invite fraternal parties that were already present in Sweden or in its immediate linguistic vicinity. Nevertheless, the internationalist stamp of the congress could not be missed. About 30 greetings came from communist parties in different parts of the world, and attending in Stockholm were the international secretaries from Norway (NKP), Denmark (KPiD) and Greece (KKE). This year, the communist party celebrates its 100-year anniversary in the struggle for work, peace and socialism. It has a history filled with names of legends and with unsung heroes. We stand on the shoulders of giants, but we must not forget that we ourselves also are a part of this glorious history, and one day others will stand on our shoulders. We will complete our historical mission, and one day the party, as well as famine, war and class oppression will be a footnote in history, a curiosity. We will have earned our rest by then. But that day has not yet come, and the struggle continues! The party′s history was also honoured, both on the jubilee festivity and in connection with a delegation from the congress, together with international guests, visiting the grave of the party’s legendary leader Sven Linderot, who lead the party from 1929 to 1951. The headstone, which was paid for by the Communist Party of Sweden (which is written on the back side) features a picture of red banners with a portrait of Linderot and the text ″Leader of workers – Builder of the party″. The party congress treated a proposition for a program on educational politics. The program was approved with a few changes. This means that the party now has a comprehensive program of importance for all categories in the education system: pupils and teachers, parents and other school personnel. This program was developed in a time of great urgency, when study after study showed, and still shows, deteriorating results in the educational system, which at the same time is privately owned to a degree that is one of the highest in the world. The program contains concrete proposals regarding how to stop the deterioration in school and education, and combines the currently important demands with the party′s long-term goals and the transition to socialism. The plans for a socialist school are sketched in the program, something which indicates the party´s maturity. The proposal for a political program for trade unions was also approved with a few changes. It is in the daily production that the antagonism between the working class and the capitalist class are the strongest. Therefore, it is also in work that the struggle for the revolutionary change of society must be made clear and strengthened. The program concludes that class consciousness must increase, and that the communist party is, and must be, the organiser of this. The trade union movement has been transformed from fighting organisations to huge bureaucratic colossi, where real democratic influence has been replaced with representatives and bureaucracy. The communists strive to make the trade unions into fighting organisations once again. And the resistance to this comes from those leaders, who in a best-case scenario may make a half-hearted radical pronouncement now and then, but who for most of the time join in the capitalist’s praises of ″the power of capitalist competition and inflation goals″, of postponed retirement age, downgrading of the social security network and so on. The program shows a clearly defined path for how to strengthen the members influence and how communists in the trade unions should act. Further, just as in the program on educational politics, there are sketches drawn up for the future, where the plans for the role of trade unions under socialism are presented. The party program was also discussed during the congress and several changes were approved. The congress was characterised by deep ideological discussions. Some up-dates regarding numbers and statistics were implemented, but the program was also updated ideologically. Despite the program being relatively new, it contained remnants of a political course that was pursued during the Cold War, when we had a socialist block that acted as a counter weight to the ravages of imperialism. This means, for example, that the view of the UN has been re-evaluated by the party. Since monopoly capitalism has an integrated need for growth, the UN cannot guarantee peace, and neither can reform in capitalist society. The new program concludes that the antagonistic relationships inherent in world imperialism, which may also result in new world wars, only can be opposed by eliminating the driving force behind the imperialist wars, namely the striving for profit, and the system that presupposes this. The party program states clearly that only socialism can guarantee a world of peace and development in the interest of the majority of the population. The earlier concept of a path to socialism step by step was also discussed during the congress. The productive forces in our time have matured and developed to such an extent that the direct transition to socialism is objectively possible. Thus, the program has been made more explicit, in the sense that it is of absolutely critical importance that the workers′ movement in every country deals directly with the question of socialism. The changes in the updated party program also state that our current society, the capitalist society, is a dictatorship. Even if it upholds a ″democratic″ facade, it is the capital that, both outside and inside of it judicial framework, dictates the terms. The capital is prepared to defend its autocracy with all available means. The working class therefore needs to abolish the state that upholds the dictatorship of the capitalist class and replace it, in defence against counter revolution, with its own dictatorship, the dictatorship of the proletariat. The dictatorship of the proletariat is construed in a vastly more democratic way than the current ″democracy″. Here, the majority of the population are given a critical influence and the state is used to protect them and their interests, rather than those of the diminishing bourgeoisie. The exploitation of human beings is made impossible. The updated party program also takes a stronger stand against those forces that claim that there is a possibility for, and try to propagate illusions about, a ″nice capitalism″ or a ″capitalism with a human face″. The taking over of the means of production and the natural resources of Sweden must be done by the Swedish working class. The congress concluded that SKP:s task is to lead this struggle by organising the most conscious elements of the working class, those that are ready to fight. Further, the party′s statutes were a subject discussed at the congress. Taking into consideration that the party has developed a basic ideological education course during the period leading up to the congress, it was natural to stipulate having absolved this course, or having equivalent understanding of Marxism-Leninism, as a pre-requisite for membership. Some other pre-requisites for membership were also sharpened. An offensive operational plan was decided upon, which the newly elected party leadership now has the task of concretising. Focus for the coming inter-congress period will, amongst others, be on strengthening the party′s organisation and the study activities. The communist newspaper will also be improved. The congress also treated the environmental questions and decided that they will be concretised in a program during the coming inter-congress period. Just as the approved programs on educational politics and the political program for trade unions, this program must clearly express the party′s visions about socialist society. For all those, predominantly the young, for whom environmental questions are important and who are worried about global warming and the water resources, knowledge must be made available about the position taken by the Communist Party of Sweden regarding climate change, green-house effect and environmental activism. A discussion will therefore be scheduled for the period leading up to the next congress. The liberation of women was another topic. The congress concluded, like earlier congresses, that the struggle for liberation of women is of great importance, but communists see other causal relationships for inequality between men and women, than for instance feminists. Inequality is not due to a power structure according to gender, but basically to capitalist society and can only be abolished together with this. Feminism is related to identity theory, one of all those theories that proclaim individuality as opposed to class, and which puts subjective experience before objective reality, and promotes idealism instead of materialism. Among other things, the congress decided that the leading organs of the party be given a collective responsibility for integrating questions of gender equality in the political, organisational and outwardly oriented work, as also in the party media. This work must always be strictly and creatively controlled. The congress adopted three pronouncements: one regarding refugee politics, one in support of the occupants of the hospital in Sollefteå and one in solidarity for the fighting dock workers. Following the congress there was also a festivity to celebrate the party’s 100-year jubilee. There was a much-appreciated music program with talented contributions of folk music, ballads, jazz and hip-hop. There also was a large exhibition showing posters from the party′s history, old membership books etc. It is now time for us to take on the work we have assumed and which we will continue to do until we have won. Even if socialism can seem to be very far away, it is never so far away that it cannot be reached by us. Lastly the Internationale was sung, and the chairman of the congress presidium, Lars Lundberg, a veteran of the party, said, just before the club hit the table to conclude the congress, ″This was the best party congress I have been to in a very long time″. Now we take new steps forward, to implement what we have decided. We are not a very large party when it comes to size, but we are undoubtedly strong. We have the powerful tool of Marxism-Leninism to help us see and understand what is happening, why it happens and what will happen in society. We know what needs to be done. Now we encourage you that are outside of the party and who wants to be a part of the liberation of the working class – come to the communist party – the Communist Party of Sweden!